The central character in Susan Naquin's extraordinary new book is the city of Peking during the Ming and Qing periods. 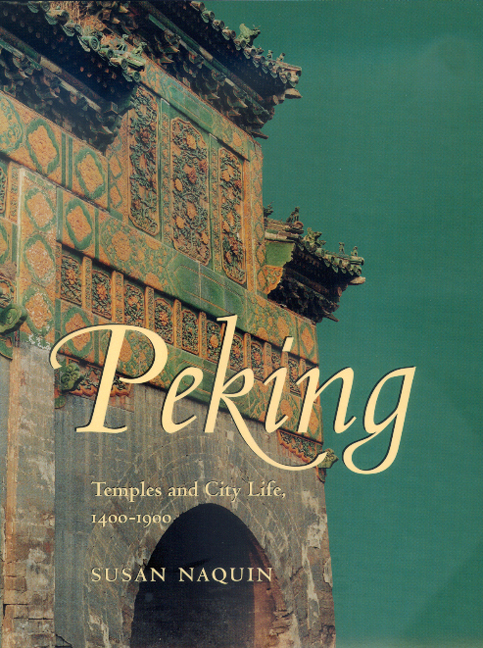 Using the city's temples as her point of entry, Naquin carefully excavates Peking's varied public arenas, the city's transformation over five centuries, its human engagements, and its rich cultural imprint. This study shows how modern Beijing's glittering image as China's great and ancient capital came into being and reveals the shifting identities of a much more complex past, one whose rich social and cultural history Naquin splendidly evokes. Temples, by providing a place where diverse groups could gather without the imprimatur of family or state, made possible a surprising assortment of community-building and identity-defining activities. By revealing how religious establishments of all kinds were used for fairs, markets, charity, tourism, politics, and leisured sociability, Naquin shows their decisive impact on Peking and, at the same time, illuminates their little-appreciated role in Chinese cities generally. Lacking most of the conventional sources for urban history, she has relied particularly on a trove of commemorative inscriptions that express ideas about the relationship between human beings and gods, about community service and public responsibility, about remembering and being remembered. The result is a book that will be essential reading in the field of Chinese studies for years to come. Susan Naquin is Professor of History at Princeton University. Her earlier books include Millenarian Rebellion in China (1976) and Shantung Rebellion (1981); as coauthor, Chinese Society in the Eighteenth Century (1987); and, as coeditor, Pilgrims and Sacred Sites in China (California, 1992).